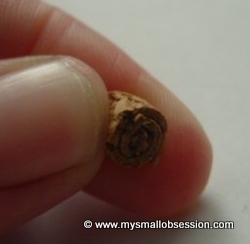 Cut cork paper into 10 small strips, about 1 1/4 inch long and 1/4 inch wide. Carefully peel the backing off of each strip. Roll the strip onto it's own adhesive to the end of strip. Now you have a small cork stopper. Trim end if necessary. 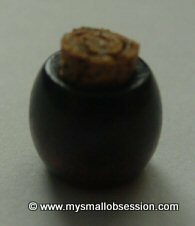 Place stopper into one end of a small bead and gently adjust to fit. Click the image below to download the labels. 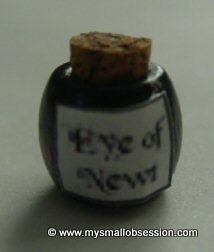 For more potion labels click here! 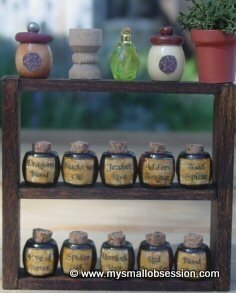 Now fill your shelves with the wicked potions! Use a variety of beads for different looks! 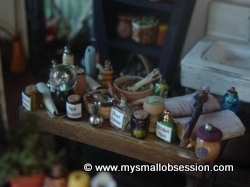 Joyce Dean follows the instructions of Kat "The Hat Lady" Hazelton to make her incredible mini potion bottles.